Why Metal Roofs are Becoming a Top Choice for Residential Roofs! The time has come to put a new roof on your home and you’re bewildered by all of the choices available. You want the most reliable roof for your home, yet one that’s cost-effective and works within your budget. Ideally, you’d probably like to avoid putting another roof on your home for the rest of your time living there. One type of roof that has become more popular for residential roofs is metal roofing. Now, you may think of the corrugated steel roofs that are often seen on commercial buildings, like warehouses or factories. Think again! Metal roofing has come a long way in the last few years and there are plenty of sophisticated and sleek options for metal residential roofs these days. There are also multiple benefits to having a metal roof, especially if you live in areas that are prone to severe weather, like lots of snow or heavy wind. Why Should I Consider Metal Roofing? If you want a roof with serious longevity, metal is a great choice for residential roofs. Some steel roofing often comes with an aluminum-zinc alloy coating, which can give the roof a lifespan of up to 100 years! On average, metal roofs can last a minimum of 50 years, and often last longer, with the right kind of maintenance. Compared to the average asphalt shingles roof, the average metal roof will last about three to seven times longer. 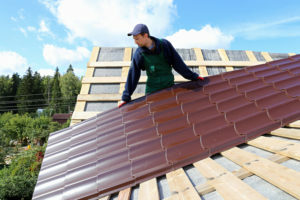 Using metal for your roof can also help you save money, in a couple different ways. The priciest types of metal (like copper, zinc, or stainless steel) will still run you about 30% less than the cheapest tile or slate roofs. Why not go for quality? The most common types of metal used in residential roofs are steel and aluminum. Additionally, with metal roof installation, you may end up saving 25% on your yearly home energy bill, so the savings continue long after you’ve had the roof installed. Do you like having options? Metal roofs will guarantee you a wide variety of options. Though there are only two general styles (vertical panels or interlocking shingles), metal roofs today offer a staggering variety of colors — over 100! These include standard, premium, and customized colors alike. Compare this to asphalt shingles, which only offer between 15 to 20 standard colors. Some bonus features to choosing metal roofs include better safety and a good green footprint. If your area is prone to high winds, a metal roof can help protect your home from damage, with a 140 mph (miles per hour) wind rating. And if you’re environmentally conscious, you may be seeking out metal roof installers pronto, since new metal roofs have an average of 30-60% recycled metal content in their products, and are 100% recyclable when they stop functioning as your roof. Not bad! What Should I Look For In a Metal Roofing Contractor? Check out your local roofing company and help support a local business. An extra bonus to going local is that they know what kind of weather your area gets and will be more alert to seeing if you need good attic ventilation, or a roof that’s durable under heavy amounts of snow. Check out their customer reviews and see how long they’ve been in business. Experience is crucial — you want someone experienced installing your new roof. Find out what kind of warranties are being offered — does your new roof come with a lifetime warranty? Fifty years? Seventy-five? Do your research and make sure you talk about timeline, pricing, and payment options with your contractor before the work begins. You want to make sure all your ducks are in a row before moving ahead. With a sturdy metal roof overhead, you won’t have to worry about replacing your roof for years to come. Even better, you can really customize the look of your roof, save on your energy bills, and be protected from high winds or heavy loads of snow. What’s not to love about a metal roof? Look us up today for quotes and to check out our showroom.